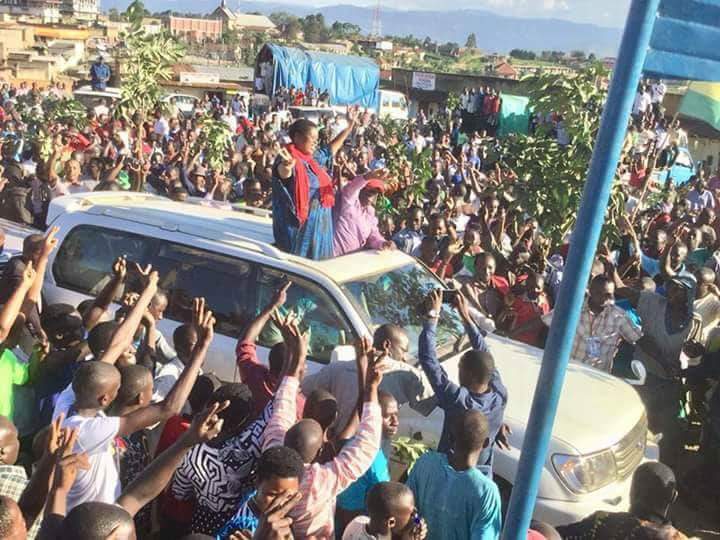 FDC’s Muzanira with Dr Besigye wave to supporters in Rukungiri on Monday. Rukungiri – The Electoral Commission on Tuesday morning delivered materials for the 280 polling stations in Rukungiri District. The materials were transported to the district over night and were offloaded from the Electoral Commission vehicle in the presence of mainly NRM and FDC officials. A total of 177,086 voters (78445- Rubabo county, 77499- Rujumbura, 21142- Rukungiri municipality) shall participate in the Thursday May 31 election in 280 polling stations and 87 parishes in 16 sub-counties, divisions and town councils. The NRM party spokesperson Rogers Mulindwa led a team of party supervisors at the centre while Mr Aloysious Mugarura led FDC party representatives, while the Independents were not represented. Mr Edwin Atukunda the Rukungiri Police Station in charge represented police. According to Rukungiri Electoral Commission registrar, Mr Umar Kiyimba says the arrival of the materials shows how much the commission is prepared for the elections. “Polling materials have arrived and we shall embark on other activities including dispatch of the materials to the polling stations. Sub counties far away from the district headquarters like Nyakishenyi, Nyarushanje, Bwambara, Bikurungu town council and Bugangari shall receive materials on Wednesday evening while others shall be dispatched on Thursday morning. We are ready for this exercise.” Mr Kiyimba told PML Daily at the EC offices in Rukungiri. Mr Kiyimba said the EC deployed a district returning officer to supervise each of the 87 parishes and wards in the district with 70 pickups and a team of registrars and other EC officials. There has been heavy security deployment in the district both in urban centres and villages. Campaigns for the by election end on Tuesday with both President Museveni and Opposition leader Dr Kizza Besigye holding rallies in the district. 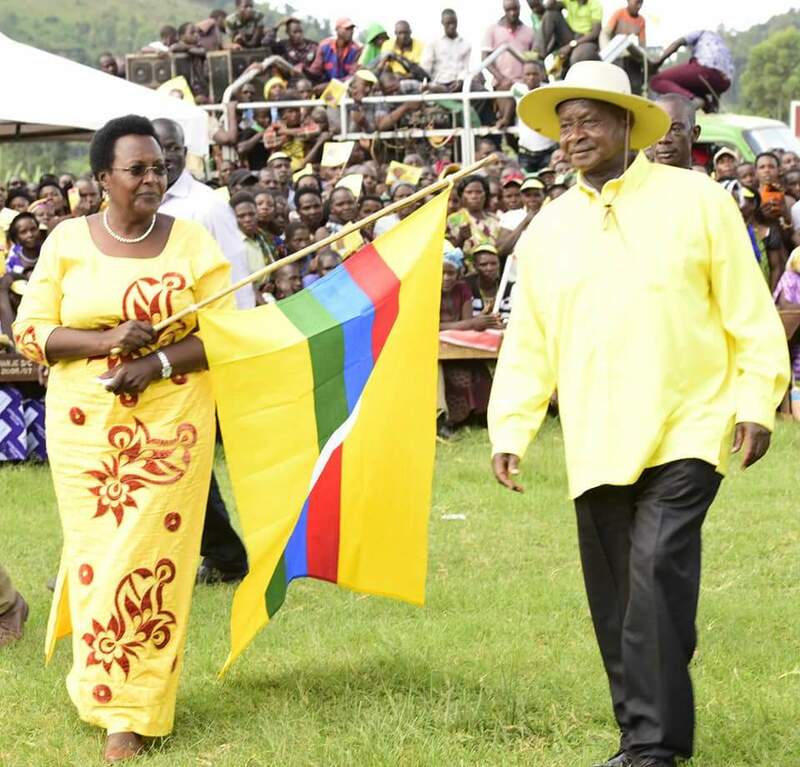 President Museveni is campaigning in Rujumbura county and Rukungiri municipality, where he is holding five rallies while his arch rival Dr Besigye and his campaign team will hold their final rallies in Kebisoni and Buyanja sub-counties where President Museveni campaigned on Monday. Six candidates were nominated for the by election which were organised after the Court of Appeal nullified the election of NRM’s Winfred Masiko on March 22, following a petition by FDC’s Betty Bamukwasa Muzanira. Besides the two top contenders, former minister of state for Public Service and former woman MP Ms Prisca Sezi Mbaguta also joined the race. Others are Ms Fabith Kunkundakwe of the Peoples Progressive Party, and Ms Elizabeth Rwakitonera and Ms Atukunda Sheila Kirebete， both independents who have since written to EC withdrawing their candidature.